When it comes to a good night’s sleep, we all have our own personal preference when it comes to our sleeping position. For many of us, the position that we sleep in has been a habit since childhood, and it may not occur to you to make any changes. After all, why break the habit of a lifetime? Of course, it’s extremely important to feel comfortable in whatever position you sleep in, or you may struggle to fully relax and get a good night’s slumber. However, there are times when you may find it is worth giving a little more consideration to the position you choose when it’s time for some shut-eye. There are many benefits to sleeping on your back, and you may already have heard some positive press about this position. That being said, many people feel daunted at the thought of having to change the way they sleep. You may be wondering if the effort is worth it. So, is back sleeping the right choice for you? We’ve been evaluating the evidence, so read our handy guide to help you weigh up your decision. What Are The Main Sleeping Styles? ys that people tend to sleep in. Which camp do you fall into? 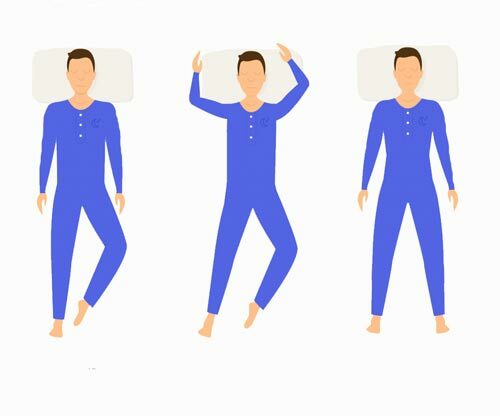 Read on to identify your own personal sleeping style. your neck and back. However, you can always make improvements, so check out our tips later on in the article to really make the most of your sleeping style. Interestingly, the vast majority of us opt to doze off on our sides. Side sleeping is a good choice as it provides good support to your neck and back, and allows you to breathe freely. However, back sleeping may be worth your consideration. Check out the rest of the article to see if this is the right choice for you. Although it may feel comfy, we really don’t recommend that you choose to sleep on your front. Why, you may ask? Firstly, sleeping on your front offers poor support for your neck and back, which can result in poor alignment and aches and pains in the morning. Also, front sleeping can compress your organs and constrain your breathing. It may well be worth considering the switch to back sleeping, so read on to find out how to make this important change. Why Should You Consider Sleeping On Your Back? Now that you know your own personal sleeping style, you may be wondering why you would want to consider sleeping on your back. This is a very good question to ask. As many of us have experienced, waking up with stiff and sore joints after a night’s sleep is an extremely common phenomenon. All too often, we may even find ourselves paying lots of money for specialist pillows or even physical therapy, all to help our poor aching backs and necks. But did you know this pain could be down to your sleeping position? Consider this. Most of us spend at least six hours a night lying in our beds, usually in a similar position night after night. If our position is less than optimal, it can cause our joints to ache when we wake up in the morning. This is because our spines and necks are in poor alignment, which can put all of our joints in an uncomfortable position. Furthermore, it can make the pain and soreness from an existing joint condition much worse. Of course, if you aren’t experiencing and discomfort, then there probably isn’t any need to make a change. However, if you’re tired of waking up sore, back sleeping may be the solution. This is because sleeping on your back can encourage your spine and neck into proper alignment. As a result, this puts less pressure on the rest of your joints, leading to increased comfort and reduced pain in the morning. Here are some other reasons that back sleeping may be a great choice. 1. If you aren’t waking up sore in the morning, you are less likely to need to spend money on specialist pillows and expensive physiotherapy. Additionally, it may even reduce your need for prescription painkillers to manage your discomfort. 2. Unfortunately, many of us find that we suffer from heartburn and acid reflux at night, and this can interrupt our precious sleep. However, sleeping on your back can actually ease the symptoms, as it raises your head above your chest, reducing the ability of stomach acid to travel up the oesophagus. 3. Some people even claim that back sleeping can lead to fewer wrinkles, as your face isn’t screwed up against a pillow. While the jury’s out on whether this is the case, if you’re considering sleeping on your back anyway, this could be a welcome side-effect! Who Shouldn’t Consider Back Sleeping? For most people, sleeping on their back is a good option. However, if you tend to snore a lot at night, sleeping on your back can make this worse (Click here to see the best and worst sleeping position). While this may not bother you, your partner may not be thrilled about your new sleeping position! Most importantly, if you suffer from sleep apnea, sleeping on your back is not the best choice for you. sleeping habits will be deeply ingrained. Do not underestimate how difficult it can be to break the habit of a lifetime! However, with the proper technique and a bit of determination, it is completely possible to train yourself to sleep on your back. If you’ve decided to make the switch, try our step-by-step guide to learning to be a back sleeper. 1. 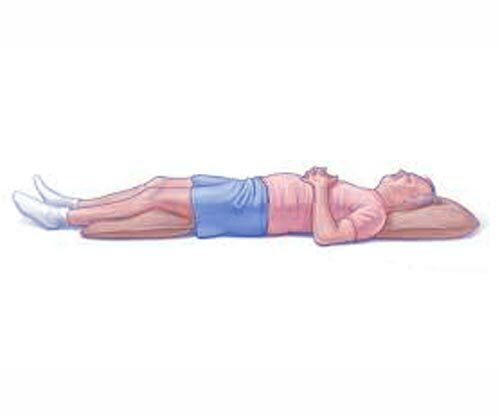 Place pillows on either side of your body, to prop yourself into position. Obviously, once you’re asleep you will have no control over your shifting positions, and many of us move around many times in the night. However, a pillow tucked in either side of you will discourage you from rolling over. 2. Tuck a pillow underneath your knees, as this will help put your spine into the perfect alignment for sleeping and reduce soreness. Furthermore, it will further serve as a deterrent from flipping onto your side or stomach during the night. 3. Be very, very persistent. Learning a new sleeping position will take time, and you will need to stick at it. At first, you may find it hard to fall asleep in your new position, but be patient as over time you will get used to nodding off on your back. Also, don’t be discouraged if you wake up back on your side or tummy. You will not learn to sleep on your back in one night alone. However, if you do come round in the night and find yourself in another position, do not be tempted to stay like that because you’re comfortable! Be disciplined and make yourself get onto your back again, and hopefully you will gradually learn to sleep like this all night. What About My Pillow And Mattress? You may be wondering what type of pillow and mattress is best for your new back sleeping ways. Can you still use the same ones? Of course, as mattresses are a big investment, we wouldn’t recommend buying a new one unless you are finding the one you have is causing you problems. But as you ask, the very best mattress for back sleepers is a medium/firm or firm mattress. This is because these mattresses give your joints all the support you need to remove pressure and ease soreness. However, replacing your pillow is an affordable option and may well be worthwhile. When it comes to pillows, we recommend just one thick pillow placed directly under your head. 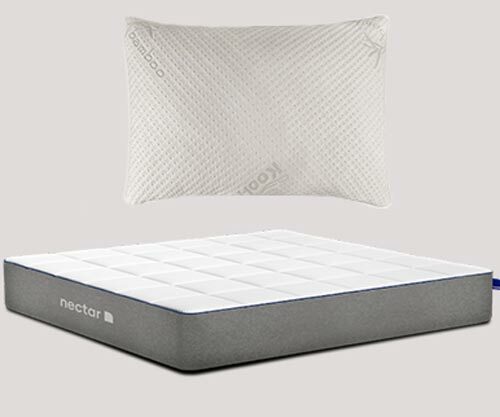 This is because one large pillow will give your neck optimum support if you sleep on your back, and prevent soreness in the morning. Neither a large pile of pillows nor a very thin pillow will put your neck in an appropriate position for healthy sleep. Additionally, as we mentioned above, a pillow under your knees is worth considering to keep your spine in the correct alignment. Hopefully, you are now in an excellent position to decide if the switch to back sleeping is one you should be making. Of course, if your sleeping position is causing you no problems or you snore or have sleep apnea, then back sleeping is not for you. However if, like so many of us you wake up sore in the mornings, back sleeping may be well worth a try. Although it takes persistence, your joints will thank you in the end when you wake up refreshed and pain free!